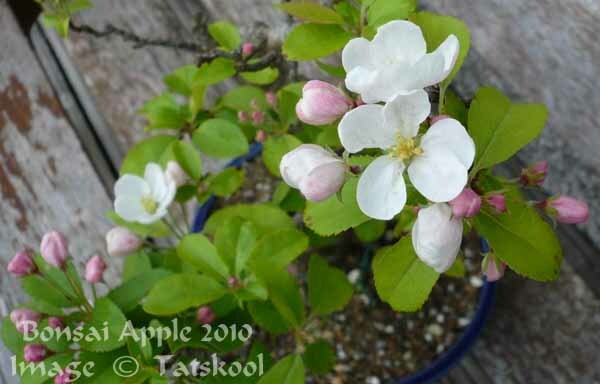 TATS A KOOL CHALLENGE: Apple Blossom time! 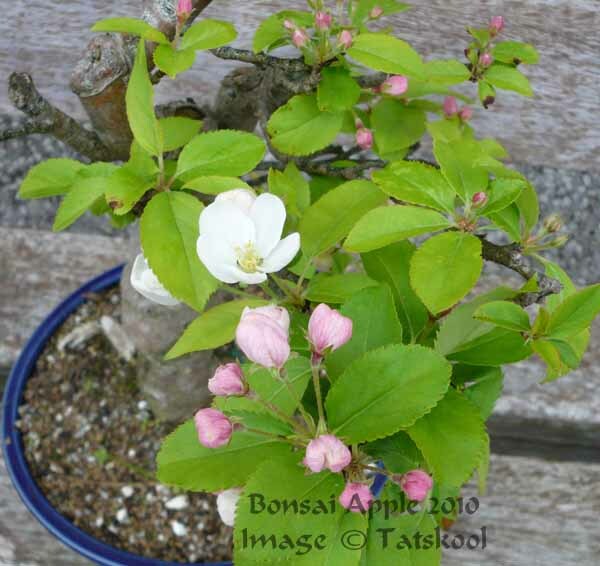 My little bonsai Apple tree survived the rough and tumble of the collapse of my display are last Autumn and is flowering it's socks off. ...and it reminds me of one of my very first dyeing endeavours to capture the lovely greens and pinks of the flowers before they open. My stash has long since been depleted, so this is a sign to me to dye it again. 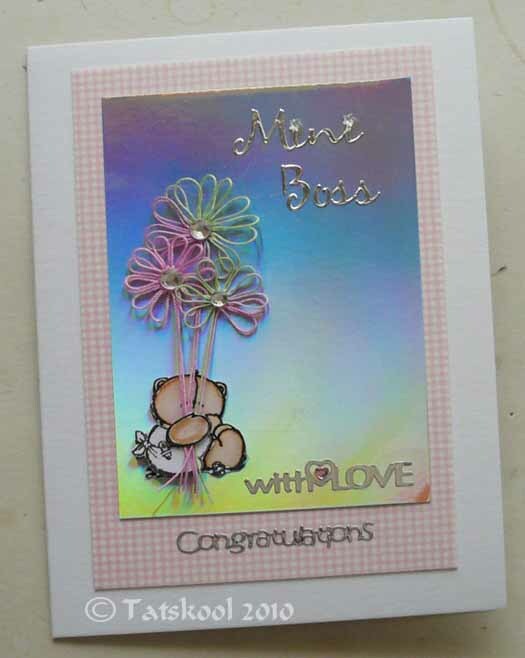 Then the flowers will go onto cards. 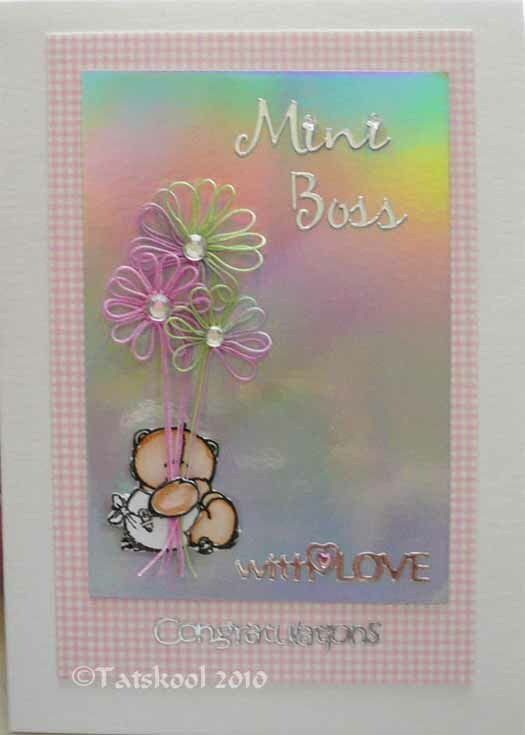 If you read tat-ology then you will have seen he card that I sent to celebrate the arrival of Mini Boss......someone we have all been waiting for....particularly Maebh who regards her as the Leprechaun version of a God Daughter!! 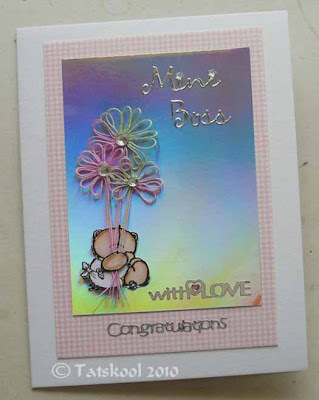 The flowers on the card were made with Apple Blossom thread. The gorgeous looking card behind the baby and flowers is my absolute favourite...holographic. Every time I look at it from a different angle is a whole new card! Very difficult to photograph. What is the true colour! .... the wood has been ordered for the rebuilding, which the two of us will do. 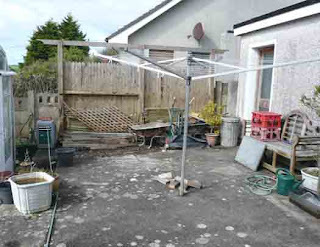 The whole area is getting a revamp,( the men 'that do' have brought their wheel barrows and cement already ) to make it a place worthy of a seat in the sun.....and yup that is the door to the dye studio....in all it's glory!! The blossom is so pretty. Gosh those photos bring back memories! Pretty card too. Hope your revamp goes well sounds like a lot of hard work though! A lovely blossom. The apple trees here ~ down below the ridge and further from foraging deer ~ are all blooming. I can picture your finished project ~ know it will be just perfect! Your applie blossom posies are so pretty and bring out the pinks perfectly! Before you know it, you won't even remember what your bonsai display area looked like before it was rebuilt...beauty is it's own reward. You're going to love it even more than the previous one. Gorgeous little bonsai. Does it get fruit, too? Here's hoping the bonsai get their new home soon with as few splinters and blisters as possible. That card is too cute for words! You really have the knack for that. Apple Blossom is a lovely colourway - perfect for the Mini Boss! It will be fun, seeing the new bonsai area being rebuilt. Thanks for your lovely comments. 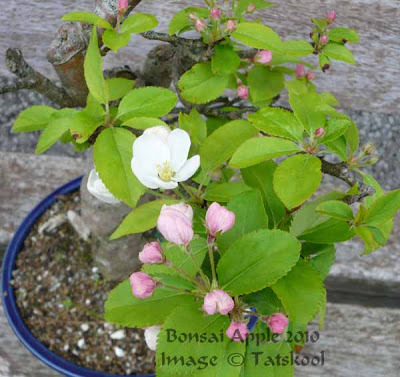 Honestly if it wasn't for the flowers the Apple Bonsai would be a gonner! Sorry for showing off about the card, but Fox did it first! When I make a little work of art like that, I can't bear to part with it so have to take photos. The Bonsai area really does look so foul, that's he last of the grotty concrete to be covered. It will look wonderful. the wood will be Western Red Cedar, tough enough to last and light enough for two oldies to build with!! I so wish we lived close, the things you could teach me!, it would be awesome. I'm looking forward to seeing the rebuilt Bonsai area. Aw Bonnie, what a lovely thing to say. I wish I lived near all of you, but this is better than nothing...much better. Thank you so much for your friendship all of you. Had to pop back in for another look at those pretty apple blossoms. And to wish (out loud) to be a fly on the wall of your dye studio one day when you are in there creating your wonderful threads.